The long running series RollerCoaster Tycoon adds a whole new dimension to the game when it launches this week for the Nintendo 3DS. The 3D immersive experience virtually puts you right into the seat of whatever your imagination holds by allowing you to construct your own coaster and then sit in first person to enjoy the ride. There’s much more to the game of course, and if you’ve never played RollerCoaster Tycoon before, the Coaster Story mode is a good walkthrough to get you acquainted to the fundamentals of how to run your very own theme park, and some very basic tutorials on how to start building your own coaster, including some practical challenges and unlockable content. If you’re also looking for a quick refresher, it’s worth the time to spend time in Coaster Story mode, although banter between your character and your “mentor”, an old coaster builder named doesn’t really add any value to the experience. 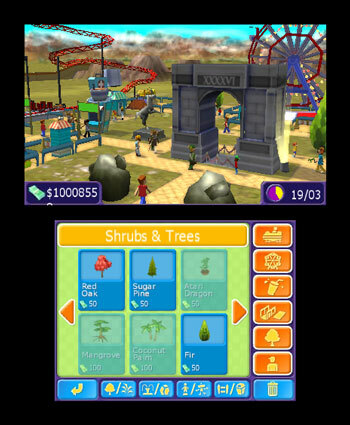 There are some other clever features of the game including adding a camera at points on the ride, so you can take a snapshot of yourself “on the ride” which you can then share with friends, and gyroscope abilities that allow you to look around the park by tilting the Nintendo DS. While RollerCoaster Tycoon is rated “E” for Everyone, the game is tougher than it looks and is really designed for teens and older. First off, there’s a fair amount to manage just within the park, including building rides, making sure they’re maintained, hiring security to handle hooligans around the park, and employees to clean up the mess from “peeps” who might get sick from riding high intensity rides (no joke). As for the coasters themselves, while there’s an auto-complete mode for finishing your roller coaster if you get stuck/frustrated, there’s no guarantee that you’ve got your own initial loops, curves and daredevil plummets correct to ensure your coaster has steam to finish the ride. Getting it right is a good challenge, and there’s some things that work against you, like not having height perspective of inclines, turns and drops relative to the ground (although segments of your track will turn red if you lay a piece that won’t work), making it a little harder than it needs to be to build a successful coaster. It definitely takes some finesse and some base understanding of gravity, but once you get it right you can take a cool 3D ride through your creation and enjoy your work and share it with others via StreetPass. If you’re not a fan of roller coasters, then the 3D coaster may still be more than you can handle. But if you are a fan, and want a challenging game that constantly moves at real time, you can check out RollerCoaster Tycoon for the Nintendo 3DS. It’s available for $29.99 on amazon.com . Well, the good news it looks like it is finally in stock on Amazon.com. I hear it is missing some critical features though, like no height markers on ride tracks. Can you confirm? “While RollerCoaster Tycoon is rated “E” for Everyone, the game is tougher than it looks and is really designed for teens and older. First off, there’s a fair amount to manage just within the park, including building rides, making sure they’re maintained, hiring security to handle hooligans around the park, and employees to clean up the mess from “peeps” who might get sick from riding high intensity rides (no joke).” i could do this when i was 5 on rct1 so you do not know what you are talking about lol not to mention this game is really fun the only problem is you cant change terrain or build underground.